and a map is used to store the visited nodes. It is the map between original node and copied node. It would be helpful if you draw a diagram and visualize the problem. visiting each edge E atleast once. What would be the time complexity? And if node is present in map, use it else create a new node and put in map. Why should it be bfs ? why not dfs?? Great code. I just wonder whether it should be queue.poll( ), instead of queue.pop( )? How about the following algorithm in C++? I don’t think we need to use BFS when copying a whole graph. 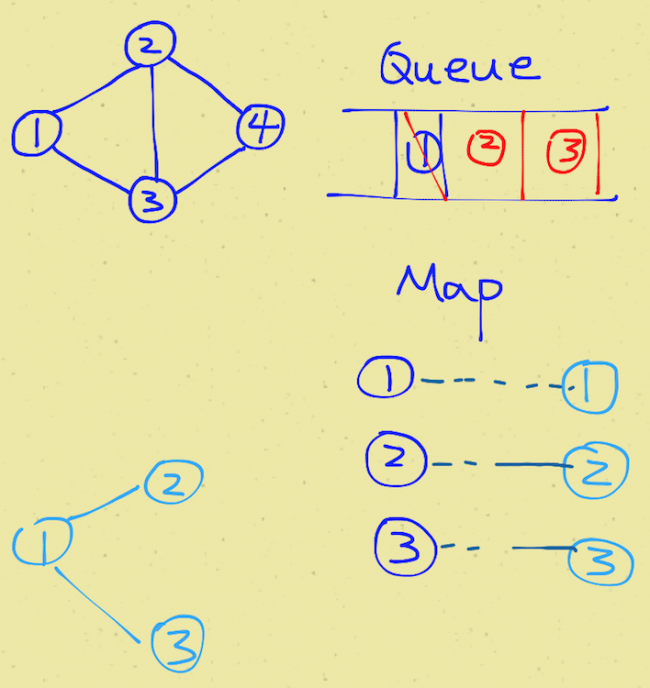 A whole graph can’t be represented by a single node but by a list of node. So I think the following approach works too. The most important thing to clone a whole graph is using hash map between original node and cloned node, not the BFS. Here is another approach which is using BFS. Thanks for your comment. I want to read your code, can you put your code inside <pre></pre> tags?